Chinatown holds a lot of fond memories for me. When I first moved to London, I remember the Sunday trips my family and I used to make. Dim Sum at New World and the weekly shop for ingredients at either New Loon Moon or Loon Fung supermarkets (both institutions in their own right), with a special treat of haw flakes or boxes of weird biscuits containing mini robots if we behaved ourselves. For an 8 year old child, weekends built up to these days. As an adult, I wrote my dissertation on Chinatown, documenting the shift from being a cultural center for the London Chinese to a tourist center for the London tourists. I even worked on Wardour st to fund my university days, popping into Wong Kei for cheeky roast meats on rice. You could say I'm quite connected. Over the years, Chinatown has changed a lot, with premises seemingly changing names as often and inevitable as the seasons. 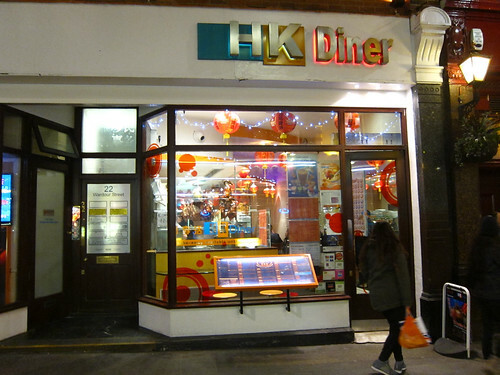 One of the few constants has been HK Diner, an institution on Wardour Street, packed equally with local young Chinese students and the older generation alike. Serving strictly Cantonese food, I hurtled in with a few of my friends and was lucky enough to stroll straight to a table. 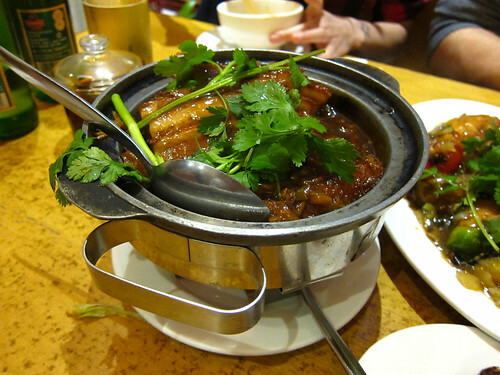 Navigating the menu in any Cantonese restaurant can often be a minefield, faced with a myriad of choices all sounding a little like the last. Playing it safe, I palmed off ordering duties to my friend who is a little more versed in Cantonese food than I am and awaited the impending feast. 'Tick" point one. Although the staff weren't rude unlike some of it's neighbours, they took our order without so much as an upward glance. Rushing about the tables, there is an air of efficiency with a whiff of sterility. This is not a place where you are expected to hang around. All being said, the food arrived quickly and certainly lived up to it's reputation. First up was some jellyfish. 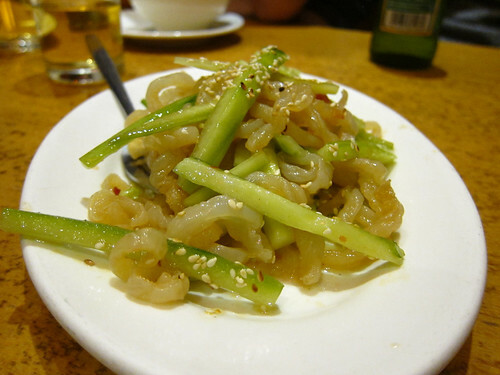 Most people who have never eaten jellyfish may balk at the idea of chowing down on jellyfish but it's really more of a texture than a flavour. Think a soft rubber band often doused in sesame oil. Still probably not sounding that appealing, but I am rather fond of it, it's well worth a try and the version at HK Diner had a hint of sweet chilli to it which wasn't displeasing. Hot on the heels of the jellyfish came the beef ho fun. 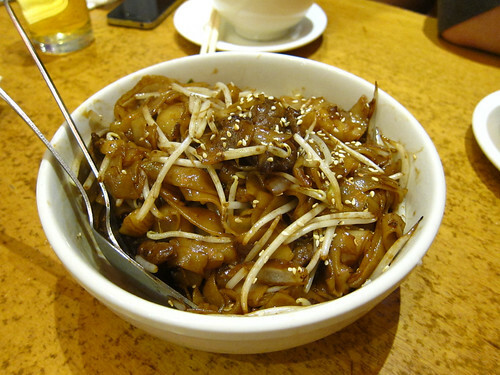 Flat noodles, slices of beef and bean sprouts cooked in a really hot wok. Simplicity itself, but it's the heat of the industrial wok which seems to reach ridiculous temperatures and impart that deep smoky flavour which really makes the dish. I'm not really all that fond of tofu. It's bland and the texture is so soft that I rarely see the addition of tofu adding anything to most dishes. On the other hand, stuff it with mince pork and then frying it just about makes it palatable. Dousing it in a garlic and oyster heavy sauce and it becomes a joy. I find it hard to resist ordering some roast meats the second I venture into the borders of Chinatown, so an obligatory portion of roast duck was up next. 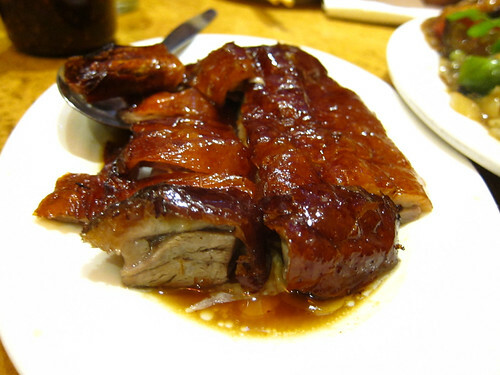 Roast Duck, roast pork and rice was my go to comfort food when I started writing this blog and it's been a while since I rated a new contender. This one was pretty decent and served without bones if requested, something I am fond of. Pea shoots are probably the most expensive of the veggies available, but there's something about that tender stem vegetable stir fried in a little garlic which I just can't resist. 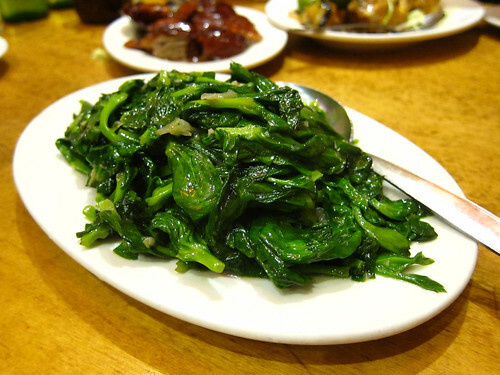 I do get horrified at the cost of vegetables in Chinese restaurants (this one weighed in at about £7 a portion) but it's well worth an order for it's delicate flavour and texture. 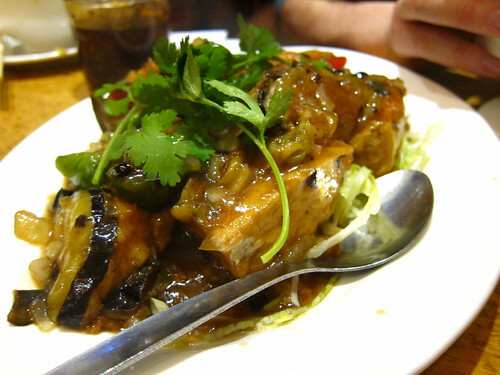 Pork belly and preserved cabbage is one of those more traditional Cantonese dishes and is packed with flavour. This generous portion is packed with sauce you just want to smother all over your rice, the preserved cabbage adding a pleasing sourness which helps cut through the rich pork fat of the belly. Moreish. 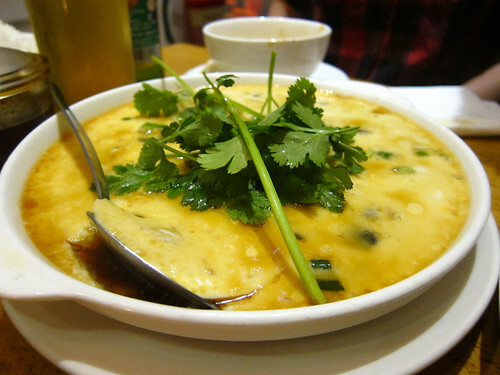 Last but not least, a wobbly comforting steamed egg. Combining standard eggs, century eggs (which are dark in colour and add a slightly chalkier texture) and salted egg yolks, this is simply steamed and served with a bit of soy. The subtle contrast in textures of the egg, combined with the bursts of flavour from the salted egg yolks combine to form an incredibly satisfying and comforting dish. HK Diner is one of the few restaurants which seems to have stood the test of time. It isn't going to win any awards for it's food, but it's decent and enjoyable and for around £20 a head, you can eat enough food to fill you beyond capacity (tick list point 3).